I absolutely love this Bible! First of all, the cover is gorgeous and lovely to the touch. I love the gold edged pages and the font of the Scripture is very easy to read and easy on the eyes. This Bible has sections on Personal Development, Relationships and Skills for those in leadership. They are based in Scripture and that were dotted throughout the Bible on nearly every page! I also loved the 52 home pages that were had 5 days of study for leadership principles. This makes this Bible a wonderful devotional/study for a full year of reading through the Bible as well as studying it in depth to help us grow in godly character. Also included are character studies of prominent people in the Bible. I found these really helpful as well as inspiring. It helped me to understand what I was reading in the Bible and to understand the people I was reading about. It just enhanced my understanding of God's Word and helped me to apply it to my own life. I love this Bible! It's a wonderful Bible for those in church leadership (including Bible study teachers as well as Pastors), as well as those in business leadership or sports leadership. 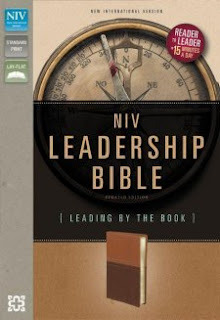 Honestly, though, the leadership principles were so good that I would recommend this Bible to anyone. It's important for all of us to grow in greater godly character. *This Bible was provided to me for my honest review by the Book Sneeze Program.